It's starting to look a lot like Christmas - and for many of us that means getting into familiar routines and traditions, like visiting the family, hitting the Boxing Day sales, gorging on too much food and falling asleep in front of a Christmas special or two on television. We're assuming you'll have your mobile with you during the festive season, and whether you can't wait for the holidays or you've been dreading them for months, there are a few apps that can get you safely through to 2017. These are some of our favourite picks. It's not Christmas if there aren't a few moments of awkward silence as the relatives gather round, so it makes sense to be primed with a few family-friendly games to keep the conversation flowing (and to defuse those seasonal rows). Obviously there are all kinds of games out there for Android and iOS but in terms of something that encourages everyone to get involved, Heads Up (Android/iOS) is definitely worth a download. It's no coincidence that it's based on a traditional party game anyway, and you only need one handset to play. If that doesn't quite suit your family, there's always Words With Friends (Android/iOS) or the perennial favourite Draw Something (Android/iOS). You might not always be able to see friends and family over Christmas, which is where GroupMe (Android/iOS) comes in - as the name suggests, it's focused around group chatting, so it's perfect for small groups of relatives or friends, and you can easily share pictures, links, GIFs and YouTube clips in your conversations. It works on the web too, if people don't want to install the app, and as an added bonus you can organise events through it as well. 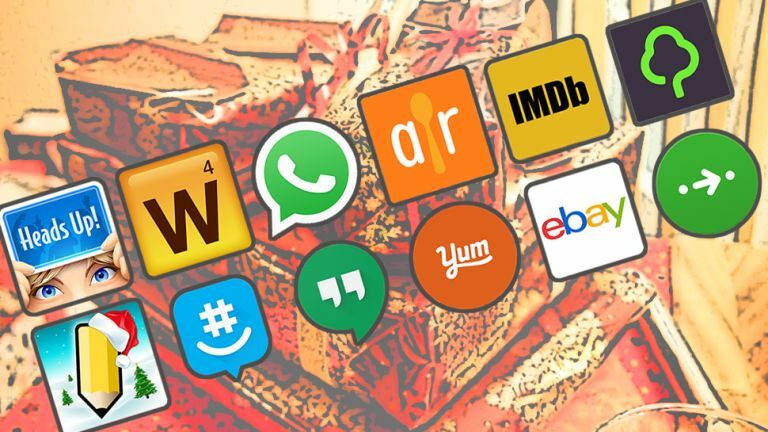 Obviously there's a pile of messaging apps you might prefer depending on what your family members already have installed, from WhatsApp (Android/iOS) to Google Hangouts (Android/iOS). Another common Christmas feeling - beyond peace and joy to all men - is wondering what you're going to do with a fridge full of leftovers. Enter Allrecipes Dinner Spinner (Android/iOS), which lets you tap in the ingredients you've got available and find a dish to suit. There are other ways to search for recipes too, from dietary requirements (handy if you've got relatives round) to cooking time (handy if you're leaving for a Boxing Day walk in an hour). There are many more recipe apps to choose from if you're doing some cooking this Christmas. Also recommended are BigOven (Android/iOS) and Yummly (Android/iOS). You might well be spending large parts of the Christmas holiday slumped in front of the television, so how you do know what's good to watch? With the IMDB app (Android/iOS), that's how - movie and TV show ratings and details, at your fingertips. With the IMDB app to hand you can stop the family from watching a real Christmas turkey in advance and instead direct them to something that's attracted far more critical acclaim. There's all sorts to explore within the app as well, including trailers for upcoming films, trivia about your favourite shows, and quick links to what's currently trending. Been given the same Christmas jumper by different sides of the family? Looking to shift your old iPhone now you've found a new one under the tree? eBay (Android/iOS) can help you get your unwanted items up for sale quicker than you might think, and you can write listings and take photos right inside the app. Even if you're an eBay novice, you should be able to get to grips with the app pretty quickly, and we've got you covered with comprehensive guides to the auction site too. There's also classifieds app Gumtree (Android/iOS), which may suit you better for larger items you're looking to get rid of locally. Apple Maps and Google Maps can always get you home, but Citymapper (Android/iOS) outshines them both when it comes to public transport, especially if you find yourself in unfamiliar surroundings. Get it pre-loaded on your phone and make sure you return home safely after the office night out. Another option is Uber (Android/iOS) - Christmas is the perfect time to sign up if you've not done so already. Make sure there's no chance of you thinking about drinking and driving and save yourself the trouble of hunting down a taxi in wintry conditions by calling one with a tap on your smartphone. If you've not yet got Google Photos (Android/iOS) up and running on your phone, Christmas is a good time to try it - it offers just about everything you want from a photo management app, from a plethora of editing options to simple sharing features. You can opt for unlimited uploads free of charge, if you don't mind some slight resizing, and Google intelligently scans your photos for recognisable objects and scenes, letting you search for anything from dogs to beaches (or Christmas trees). It's the photo storage and management service to beat right now, and it means your Christmas snaps will be automatically backed up to the cloud. Interested in some of the best ever Christmas movies? Of course you are.